Leverkusen - Bayer 04 Leverkusen are currently providing living proof that an air of familiarity can sometimes be all it needs to rediscover hunger after a period of stagnation. When the results dried up, Leverkusen's decision makers turned to former joint coach Sascha Lewandowski in the hopes of rediscovering the spark which seemed to have gone out under Sami Hyypiä. The result has been back-to-back Bundesliga wins, and a timely revival in view of UEFA Champions League qualification next season. That looked beyond any doubt during the first half of the season when the Werkself led the chase of FC Bayern München at the top of the table, but with VfL Wolfsburg and Borussia Mönchengladbach finding their stride in 2014, it has come perilously under threat due to Leverkusen's loss of form. Lewandowski, who first took Leverkusen's reins in April 2012, leading them in unison with Hyypiä until the Finn took sole charge last summer, has restored much-needed belief. With four games of the season to go, Bayer 04 are now back where they want to be, challenging for a return to Europe's top table next season. There is still some way to go, however. "If you want to play in the Champions League, then you've got to play better football," Lewandowski said in an interview with Sport1. "We've still got to improve considerably. We've got to forget about reaching an ideal situation - we only have three weeks and so we're not going to get there this season - but we're heading in the right direction. For a long time, self-confidence and fighting spirit were our strong points and we've got to get them back." 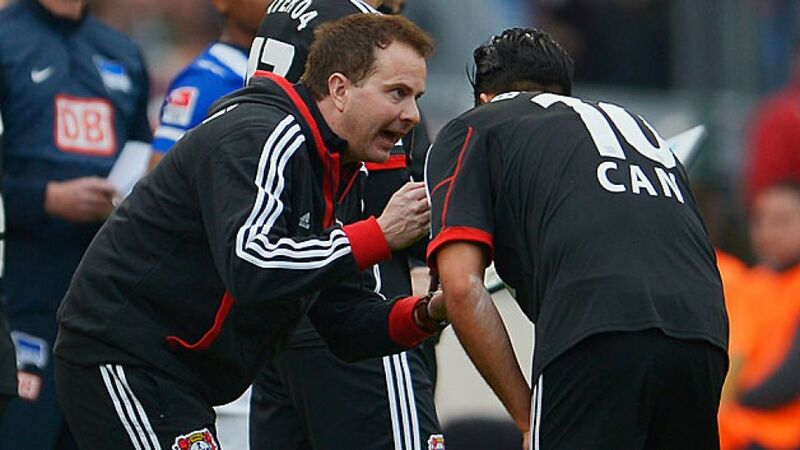 In Leverkusen's last two games – a 3-2 win over Hertha Berlin and 4-1 triumph at 1. FC Nürnberg, it looked like the minor changes Lewandowski had made in his short time back in the hotseat had made a difference. Those changes were not so much tactical or technical, but rather psychological. "We had to get some more positive emotions back," added Lewandowski, who averaged 1.92 points per game in his first stint. Julian Brandt made his first starts under Lewandowski, and personified all that the BAyer 04 boss was looking for. "He's very self-confident, while he's keeping his feet on the ground too," said the coach of the 17-year-old. "They are factors that are incredibly helpful. He's a gem." That gem needs looking after as preciously as fourth spot, and Leverkusen are now doing both, thanks to a familiar face in the dressing room.